We are approaching the 150th Anniversary of the assassination of Abraham Lincoln in Ford’s Theater. In her fourth adventure, Little Miss HISTORY arrives in a horse and buggy at its doors to visit a place that has witnessed the best and worst of times. Its walls have heard laughter and tears. This nonfiction picture book is illustrated in somber tones that convey the mood of the tragic events that unfolded there. 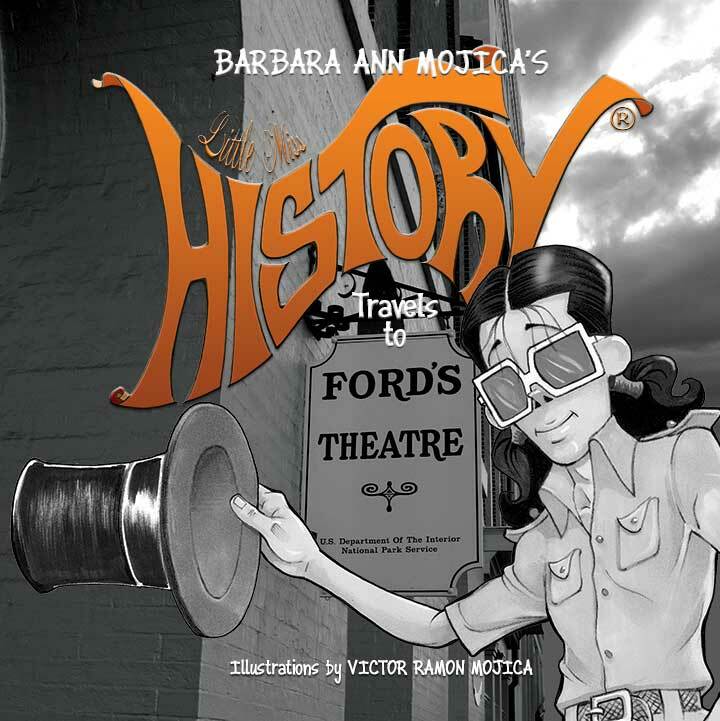 Little Miss HISTORY keeps spirits up by wearing a top hat like Lincoln and a Roman toga while acting in the theater, but she is well-aware that she is visiting a darker part of America’s history. Learn why many believed the building was cursed. Gaze at the Derringer pistol that fired the fatal shot. Study the boot that John Wilkes Booth wore while injuring his leg during his attempt to escape. See the bed where President Lincoln died. Crane your neck up to stare at the Tower of Books written about Abraham Lincoln in the Center for Education and Leadership. Let Little Miss HISTORY be your guide to learning how Ford’s Theater has become a living memorial to Abraham Lincoln and to the resilience of a country made whole once more. This was an ambitious time of history to tackle! I look forward to reading this installment of Little Miss History’s adventures! Thanks for sharing this at Booknificent Thursday! Yes, you are right, but it was fun! I have visited this place and sat in the box right next to where he was shot. It looks like you have written an amazing book. I love history! Yes, you are definitely in awe when you sit in the theater. My objective is to recreate the historic events and settings while making them real and meaningful to my readers. Woot! Did not realize that there is a new Little Miss History! Am loving this series!! Congrats and thanks for sharing at the Kid Lit Blog Hop!! Thanks, Oh yeah! Ford’s Theater is going strong, and I am already working on a new release in the next few months.